Captain Jay Kavanagh has over twenty years of experience charter fishing out of Hatteras Inlet, Oregon Inlet and Ocean City, Maryland. The Bite Me is a fast and well-maintained, locally built custom Carolina Sportfisherman, getting you where you want to fish in no time! That means more time for you and your party to fish. Equipped with air conditioning and heat, this Outer Banks charter fishing boat is a comfortable ride to and from the fish. Bait, ice, tackle and fishing licenses are all provided by Captain Jay and his crew, so there's no need to worry. 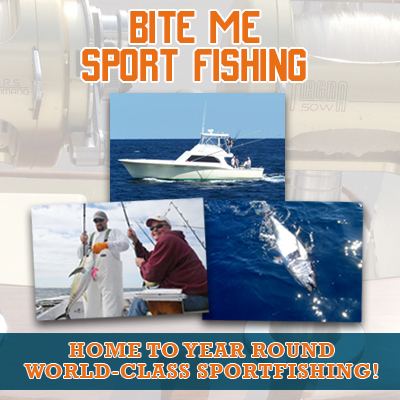 Charters are available all year, so there’s always an opportunity to catch something. Visit our website for t-shirts, hats, stickers, sweatshirts and other merchandise!